Did you know long-term travel is not actually as glamorous as it may sound? So I’ll tell you about today, which was fantastic (up until about an hour ago), and see how many bugs I kill in the time it takes to write this. When I left Mardin I didn’t know where I was going. I had two possible destinations, Midyat and Hasankeyf, and conveniently enough, you have to go to Midyat first either way. It didn’t look like much as we drove through, some nice monuments and undoubtedly nice people, but nothing crying out to be visited. I’ve spent most of my time in Turkey in medium-to-large cities, so a smaller town sounded good anyway. Onward to Hasankeyf! I was expecting a small, potentially sleepy town, but I stepped off the bus into a tourist carnival. Vendors were selling cowboy hats, bow & arrow sets, and plush dolls of the Gangnam Style dude. I admit, all three appealed to me. A dude with a hotel on the corner pounced (it all seems so obvious in hindsight) and showed me a room that was not too cigarettey (it is Turkey after all) and with a good price, but it was the view out the back that sold me. He recommended I start walking through the souvenir frenzy, and his friend has a restaurant just past the mosque. 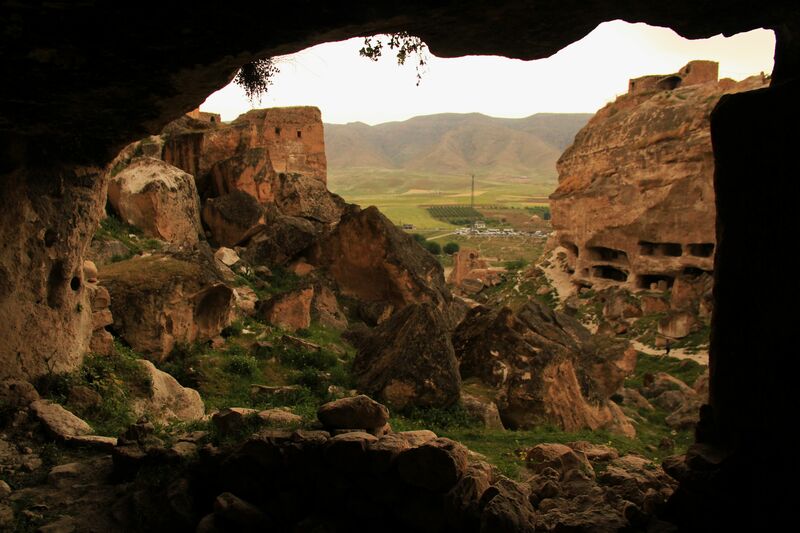 Hasankeyf has a 15th century mausoleum, a mosque from 1409 that apparently included a harem, and the ruins of a bridge built by the Artuqid Dynasty somewhere in the 11th or 12th century, probably on a Roman base, which spans none other than the legendary Tigris River. But it wasn’t any of those that made me ask myself “Where the hell am I?” in wonder. That came first from the medieval citadel perched on the absolute edge of a 135 meter-high cliff, and then from the cave houses. 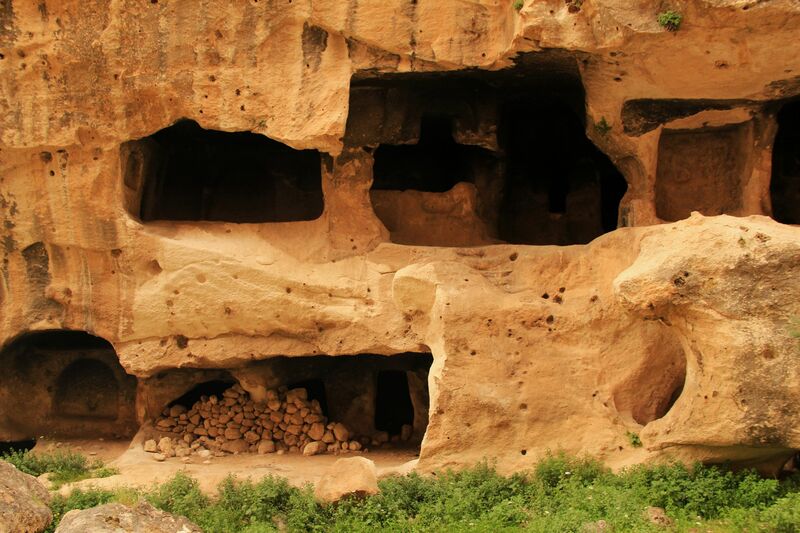 Cave houses! Who? When? What happened? I was in love. 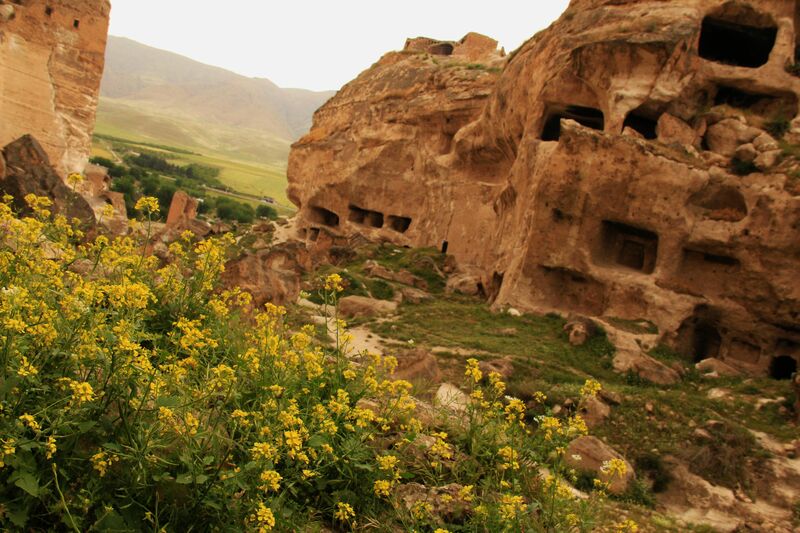 Cave house ruins with a vista over the Tigris! They call it the Dicle Nehri here, but that’s one of the two rivers that flowed out of Eden, which is less mythologically potent than the spell cast by such exotic names when studied in grade school. If only Mrs. Hallas and the rest of my fourth-grade class could see me now! The story’s about to get better, in my opinion, but I hear tell that readership declines rather precipitously after about 400 words, and this is number 590. Since I actually want y’all to read the next part, I’ll split it into two. It’s time to risk the bed bugs, but assuming they don’t bleed me dry, I’ll tell you tomorrow about reaching the Edge of the World, and the friends I made there. Good night. It looks like it was totally worth putting up with the bed bugs. OK almost worth the bed bugs. I stayed up until after 3:00, but literally fell asleep while writing that last blog, so gave up and went to sleep for a few hours. I reminded myself that it could be much worse, it could be something venomous! (I’m aware of the fact that my intended destination of SE Asia has snakes and whatnot…) Hope you had a good night too! The panorama photo is awesome. Medieval citadels!?! Cave cities! What!?!? 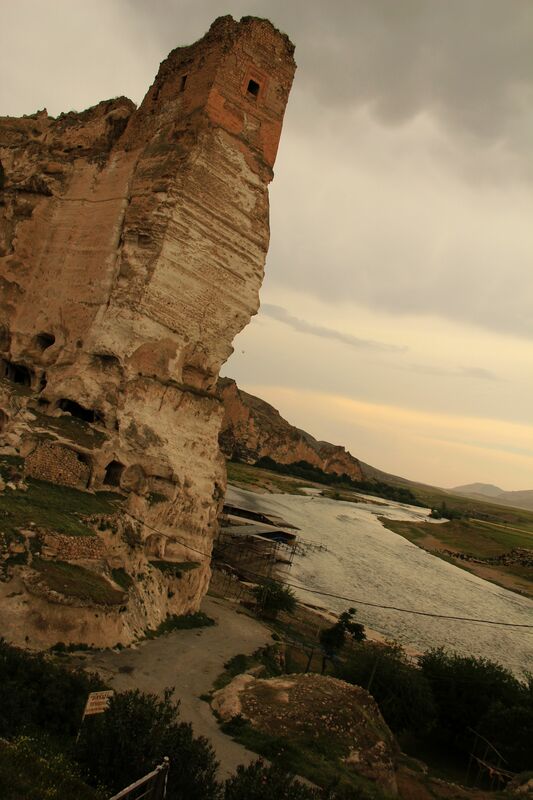 Serendipitous call on Hasankeyf. Although, if you send me a gagnam style dancing doll for my birthday, I will be less than impressed. Did you have the luxury of eating lunch in one of the cave houses and watching the river unfold below you? I am going to imagine you did. Goats and all.